The entry door of your home is perhaps the most important door in the entire house. It’s the one most people use all the time. It’s the one people see first, making it the first impression door. With that in mind, you certainly do not want a drab, dull door that doesn’t make a statement. Or worse, one that makes a statement you don’t want it to make at all. Your entry door should be a perfect marriage between functional and elegant so that it says what you want it to say from the outside, but does what you need it to do from the inside. Entry doors are made with a variety of materials, in a variety of shapes and sizes and colors. 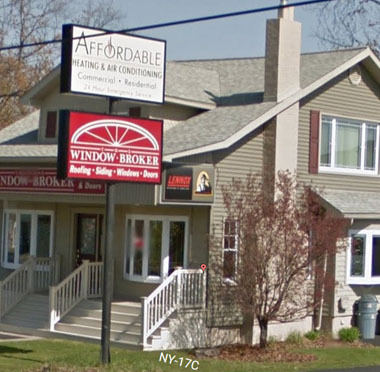 At The Window Broker, we know that not every door is right for you, and that you want your home to stand out from the rest. Our replacement entry doors are designed to function in every capacity, from keeping the weather out and the paid-for air in to making sure that everyone who approaches is just a little bit impressed. One thing we know is important to many homeowners is a functional and secure storm door. This additional door is installed in front of your entry door to keep the bad weather at bay and your home safe. Storm doors are something that you should seriously consider when it comes to entry door replacement. They are not only a good idea, they are also necessary in many weather conditions, and they offer a number of valuable benefits. One thing that people without storm doors cannot do is open their entry door on a beautiful day. A storm door is designed with either glass panels you can open, or with strong screens to keep bugs and animals out while allowing the fresh air in. Your entry door is personal to you, but you do have to make some decisions. Not all doors are created equal, which means you’ll have to choose from several different options to help make your final decision. There are a number of door options you have to choose from, and we want to help you choose the one that best complements your home and works with your budget as well as your personal taste. Call us today at (607) 798-9954 to schedule a complimentary estimate for your entry door replacement needs. You can also fill out the form on this page to schedule a free consultation. Our door experts at The Window Broker are knowledgeable, friendly and excited to help you change the overall look and feel of your home from the front door.